Request up to 25 of the dreams cards FREE with every order you place! (Excluding download-only orders.) Just specify how many you would like when checking out in the shopping cart. Spread the good news that God is still giving wise counsel through dreams at night, and His counsel is free! You can also put these principles on the back of your business cards! Imagine how that changes the dynamic of handing someone your business card, and the substantial increase in perceived value to the recipient. God speaks to you through dreams. The symbols come from the dreamer's life. The meaning comes from the dreamer's heart. Sometimes you just want to put something into someone's hand that will point them in the right direction. You know they are hurting, and you want to help. This dreams wallet-size card is perfect to leave for people to pick up, or to hand to people, letting them know that God is alive and communicating with them at night through their dreams, just as He did in Bible times! 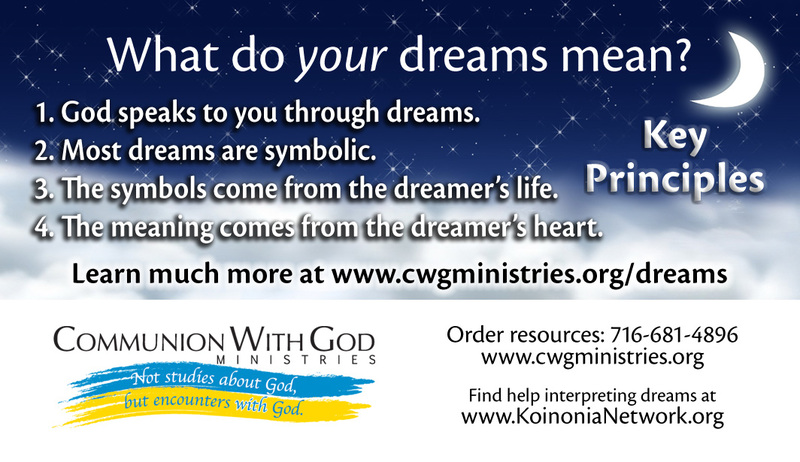 Check our our dreams products here to discover more about hearing God through your dreams.